Texas Killing Fields does not come with many twists and turns. There are no secret bad guys who appear innocent or corrupt cops doing the killing. The people who appear bad are likely to actually be bad, and this allows for a straightforward crime film which stands on story and characters alone. And it stands rather tall in a genre which can often feel tiresomely familiar. 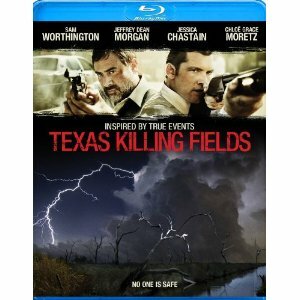 Even with no surprises or revelations, Texas Killing Fields is an impressive film because of good filmmaking alone. Inspired by true events, this crime thriller follows the investigating done by homicide Detective Heigh (Jeffrey Dean Morgan) and his close friend and partner Detective Souder (Sam Worthington) after a serial killer begins dumping bodies just out of their jurisdiction. The corpses of the women and girls being slaughtered and dismembered are dumped in a marsh called “The Killing Fields” by locals. Despite warnings by his partner, Detective Heigh insists on pursuing the investigation which they aren’t responsible for. This ends up attracting the attention of the serial killer, who begins playing his own games with the detectives. This includes targeting a young local girl (Chloë Crace Moretz), who has always been able to rely on our protagonists when her home life was too difficult. In a race against time, they set out to save the girl and catch the killer. The Blu-ray includes an audio commentary with director Ami Canaan Mann and writer Donald F. Ferrarone. The actual high definition presentation of the film is not exception, but this is mostly because of the lower budget and grittier feel to the photography. It just doesn’t make as much of a difference, though there are a few shootouts and chase sequences which are certainly enhanced by the 7.1 TrueHD surround sound. Many critics used Rocky as a comparison for Real Steel, only with robots, but it seems to me that the plot is much closer to resembling another Sylvester Stallone vehicle instead. Over the Top is about a distant father given a cross-country trip to get to know his son better, and Real Steel has a similar scenario between irresponsible father and financially stable son. Only set in the future instead of the 1980s, and with robots instead of the Italian Stallion. 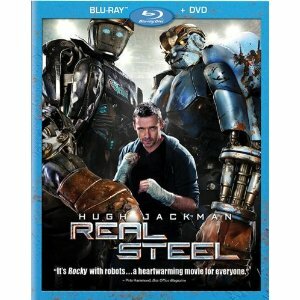 Hugh Jackman stars as Charlie Kenton, a washed up fighter who has turned into a promoter for the robot fights which have replaced humans in the boxing ring. His haphazard and reckless treatment of the robots, along with a strong penchant for making bets he can’t afford, Charlie finds himself deep in financial debt when the added trouble of a custody hearing also comes up. With the death of the boy’s mother, Charlie is the rightful guardian, though he has no relationship with the boy and other wealthy family members are eager to earn custody. Seeing a way to benefit financially from the relationship, Charlie agrees to take his son along with him on a cross-country trip. After discovering a beat-up training robot perched on a muddy slope over the ravine beside a dump yard, Charlie and his son build a relationship as they build a fighter. Standing at 8-feet, their robot is one of the smallest competitors in the business, relying on the boy’s video game experience and Charlie’s boxing skills and knowledge to win. Against all of the odds, this unlikely trio find themselves on a winning streak that eventually pits them against the world champion robot. Although we are never asked to believe that their robot named Atom has emotions or is human in anyway, it is certainly clear that he is different from the rest of the robots. There is more expression and humanity within his movements and his face, making him feel like a combination of Wall-E, the robot from The Iron Giant and every great underdog boxer in the history of cinema. The Blu-ray release of this special effects blockbuster features a spectacular high definition presentation, fully equipped with 7.1 DTS-HD audio for the metal crunching soundtrack. The 2-disc combo pack also includes a DVD version of the film, along with a few special features. 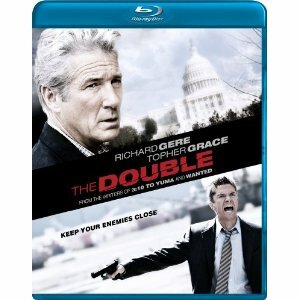 There are bloopers, two making-of featurettes and an audio commentary with director Shawn Levy. The Blu-ray disc has these features as well as three exclusive features. There are deleted and extended scenes with an introduction by Levy, a featurette about Charlie’s story before the robots, and an exclusive second-screen feature compatible with iPad. The Ides of March is a unique and brilliant film about politics, bringing a view which was profoundly effective first in the play by Beau Willimon, who lent a hand in adapting the screenplay along with director and co-star George Clooney and his writing partner, Grant Heslov. What makes this film so profound is not the fact that it exposes corruption and all kinds of backdoor bargaining going on within a presidential campaign, but the manner in which the layers of individual mistakes can effectively coerce any given political decision. And it does all of this with spectacularly written dialogue and immaculate performances all around. The film follows in just a brief portion of the election campaign, during the Ohio primary which may determine the election’s final results down the line. These tense few days are given added pressure after a series of coincidental events force presidential candidate Governor Mike Morris (George Clooney) to rethink his strategy. Although he always seems to be present, hanging on the wall nearby or on television in the background, this film is less about Mike Morris than it is Stephen Meyers (Ryan Gosling), an ambitious campaign worker who has a lot to gain from the election of Morris. Working only under a close friend (Philip Seymour Hoffman) and the Governor himself, Meyers is both idealistic and hard-working, though this does not necessarily make him incorruptible. Clooney started his directorial career with a lot of flash, and some critics called his debut over-directed. Then Clooney dove deep into films about politics. The Ides of March takes elements of all of these, though each more subtle than before. Clooney has come into his own as a solid filmmaker, as well as an actor. 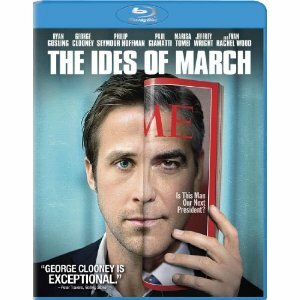 The Blu-ray release of The Ides of March includes a 1080p high definition experience, along with 5.1 DTS-HD audio. 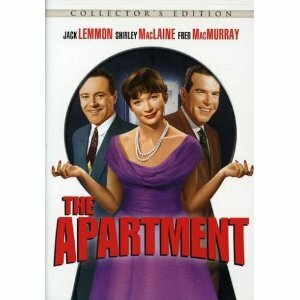 The special features include a commentary track with Clooney and Heslov. There is also a featurette with Clooney, and another about the entire cast of this film, which also includes Marissa Tomei, Paul Giamatti and Evan Rachel Wood. The remaining two featurettes are about the political aspects of the film. Relativity Media has partnered with global branded play company Hasbro, Inc. to develop and produce a live-action tent-pole film based on Stretch Armstrong, the iconicaction hero figure launched in the 1970s, it was announced today by Relativity’s Co-President, Tucker Tooley and Hasbro’s President and CEO, Brian Goldner. The film will be produced by Relativity’s CEO, Ryan Kavanaugh (The Fighter), Hasbro’s Goldner (Transformers) and Bennett Schneir, Senior Vice President and Managing Director, Motion Pictures (Battleship). Tooley (Immortals) will serve as executive producer. Since 2007, Hasbro's Transformers and G.I. Joe franchises have grossed nearly $3 billion at the worldwide box office. 2012 is shaping up to be another stellar year for Hasbro with its partners Universal Pictures releasing Battleship in April and Paramount Pictures releasing G.I. Joe: Retaliation in June. Stretch Armstrong is the classic action hero figure first launched by Hasbro in 1976 and re-launched in the 90’s, sold successfully throughout North America and in markets across the world. 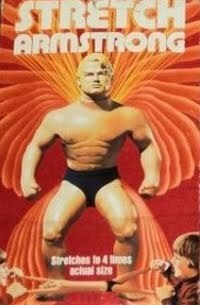 The original Stretch's unique design broke free of traditional action figures, as he could be stretched over and over and always returned back to his original size. The nostalgic toy is considered to be rare and collectible to this day. Revenge is a common theme in Chinese action films, and even just in the filmography of producer Johnnie To, who is best known for another film called Vengeance. This one is called Punished, though it is somewhat of an untraditional revenge film. There are more layers of plot and morality than the average revenge film, though it packs just as much excitement. Punished begins as a rather unpleasant family melodrama. It feels like a Chinese episode of “The Sopranos” when the drug habit of a powerful man (Anthony Wong) becomes more than just an embarrassment. Her behavior threatens business, which somehow feels slightly less than legitimate, but none of this is an issue when the daughter is suddenly kidnapped. The reasons for this kidnapping are unknown, and even after the ransom is paid she is killed just the same. This is when it becomes a revenge film, though there is a certain level of distance in this vengeance. Instead of dirtying his hands with the act of murdering the people responsible for his daughter’s death, the tycoon hires his ex-bodyguard (Richie Jen) to do it instead. Determined to make enough money to ensure his son’s financial stability in life, this bodyguard is willing to throw everything away in order to destroy the culprits. He videotapes the deaths and sends them back to his boss, who only becomes involved with the final death. The DVD release includes a featurette about the making of Punished, as well as one about the direction of the cast by Law Wing Cheong (Tactical Unit, Comrades in Arms). There is also a stills gallery from behind-the-scenes.